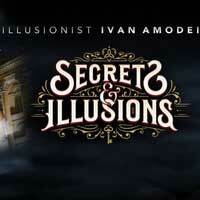 Prepare to be dazzled as master illusionist Ivan Amodei brings his acclaimed new show, Secrets and Illusions to the Thousand Oaks Civics Arts Plaza. A triple entertainment experience of magic, storytelling and audience participation, this thrilling 90-minute performance transports you to the Louvre's endless galleries, where you'll witness Amodei unravel ancient mysteries -- and maybe even the meaning of life -- within priceless works of art. Recently honored by the mayor of Beverly Hills, Calif., for his contribution to magic, this highly skilled performer's amazing technique and theatrical flair have earned him the reputation as "Entertainer to the Stars." Don't miss the show that the Boston Globe describes as "magic with a message."